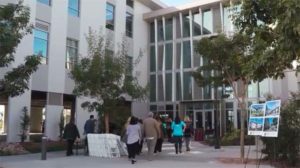 A group of San Diego County representatives Tuesday celebrated the grand opening of the North Coastal Live Well Health Center, which will offer behavioral and mental health resources for residents in the county’s northern region. The facility includes multiple mental health clinics and outpatient programs, a substance use and abuse recovery center and a resource center for local military members and veterans. A public health clinic is expected to open in spring 2019, according to the county. The North Coastal Mental Health Clinic and the Mariposa Clubhouse will offer counseling, case management, job training, outpatient care and rehabilitative services for adults with a serious mental illness. Both facilities will be managed by San Diego-based nonprofit Mental Health Systems Inc. The Live Well Center’s Military and Veterans Resource Center will host multiple local organizations that will help veterans and active-duty military members obtain the resources and benefits they may need. “This is a great day for military veterans and their families here in this community and throughout San Diego County,” said Office of Military and Veterans Affairs Director Wilfred Quintong.